The 2019 Toyota Highlander is the perfect vehicle for everyday driving, weekend adventures, and transporting the kids to practice or events. 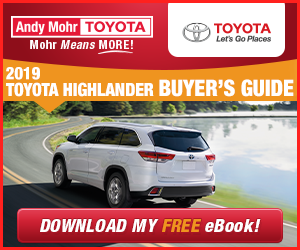 Discover the 2019 Highlander at Andy Mohr Toyota. With high Toyota Highlander safety ratings, this vehicle is well-regarded in the industry. Drive the roads of Avon, Indianapolis, and Plainfield in a vehicle that provides outstanding safety, from the active safety features to passive options to driver assistive technology. We’ve put together this comprehensive guide, discussing the most important Highlander safety features. The Toyota Star Safety System™ is a convenient suite of six active safety features to keep you, passengers and other vehicles around you protected. This system includes technology that can correct understeering or oversteering, provide better traction control, and help with operating the brakes if there isn’t enough pressure being applied. Enhanced Vehicle Stability Control: This prevents sideways slippage of the vehicle when understeering occurs or a strong oversteer while turning a corner. Traction Control: This prevents slipping of the drive wheels when the accelerator has been depressed in an excessive manner when accelerating on slippery pavement. Anti-lock Brake System: This prevents the wheels from locking when the brakes are applied in a firm manner or when pressing the brakes on a slippery surface. Electronic Brake-force Distribution: This uses the ABS system for proper brake force distribution between the front and rear wheels. The advanced airbag system will protect both you and your family. It includes driver and front passenger dual stage airbags, driver and front passenger seat-mounted side airbags, a driver knee airbag for added protection, front-passenger seat-cushion airbag, and roll-sensing side curtain airbags for each row. The LATCH (Lower Anchors and Tethers for Children) is a helpful feature for the smaller Toyota Highlander passengers. These can help you securely strap in a child with a car seat and ensure they’re buckled and ready for the ride. Lane Departure Alert with Steering Assist: If you’re drifting over the line in your lane, the system will issue an alert and visual warning. If the system determines you aren’t able to correct course, the Steering Assist function will gently correct steering and keep the Highlander in its lane. 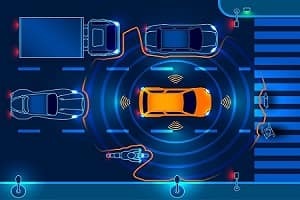 Pre-Collision System with Pedestrian Detection: By combining radar with a camera that can recognize shapes, an audible warning will be provided to let you know of a possible pedestrian collision under certain circumstances. If you can’t react in time, automatic braking support kicks in to decrease chances of a collision. Automatic High Beams: This system can pick up on other vehicles as far away as 2,000 feet. Depending on the driving situation, it can automatically switch high beams on and off, so other drivers can pass you safely. Thanks to a strong offering of active and passive safety features, along with helpful driver assistive technology, the Toyota Highlander is, overall, a very safe car to drive. It’s available now at Andy Mohr Toyota. Shop our online inventory in Avon, Indianapolis, and Plainfield, then stop by our showroom to see it for yourself today!